The institution's brand identity includes the symbols, logos, images, words and official colors that represent the institution or its athletic programs. As a relatively new brand, consistency is critical to reinforcing the brand name and image. Any use of institutional logos and images are expected to follow the brand guidelines. View our portfolio for examples of how our official logos and brand appear on marketing material. Institutional Logos are available in a low-resolution format. Please contact Marketing and Communications if you need high-resolution files. Unit logos are created by the Office of Marketing and Communications with the approval of the Academic Schools/College or the Division leaders. If you need a unit logo, please email Marketing and Communications. Our library of sports-specific word marks contains these nine images: Athletics, Rugby, Baseball, Soccer, Basketball, Softball, Cheer, Tennis and Football. Email signatures are a part of institutional branding. We ask that all faculty/staff used the branded email signature for new messages and a text version or replies. No other information should be included (quotes, images, etc.). Follow these instructions on how to replace your email signature – on a desktop, webmail app and a Mac. Within any Office application, go to File>Options> + enter info within “Personalize your copy of Microsoft Office”. All other applications (Word, Excel, Powerpoint) will automatically update. Digital - Sub-branded digital letterhead (in Microsoft Word format) will be provided to the units based on guidance from Deans and Divisional Vice Presidents. If you have a need for a sub-brand logo, please contact us at Marketing and Communications. Print – To order print letterhead, please go through unit p-card holders. Business cards are designed by the MarComm Office; however, the business office oversees ordering and payment. To order business cards, please go through unit p-card holders. The Business Card Request form can be found on Purchasing's web page. Details the business card format can be found on the form. If you have a special request that deviates from the following design, please contact Marketing and Communications. Name tags should be requested through Human Resources. For institutional presentations, please use one of the provided PowerPoint templates: for widescreen, standard screen and widescreen with dark background. 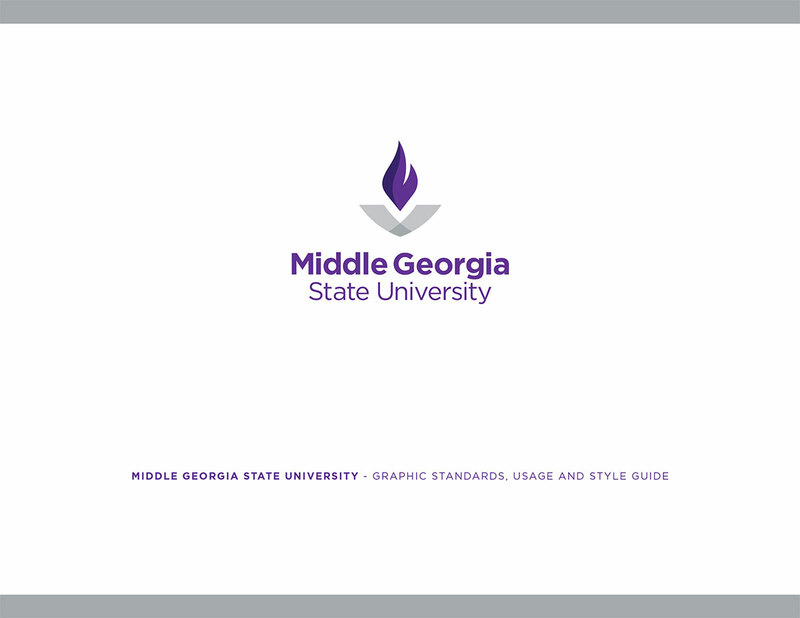 When referring to the institution, Middle Georgia State University and Middle Georgia State should be used (in this order). Repetitive use of the name, social media and other similar shortened usages may require an acronym. In those cases, MGA is the acronym to be used in institutional communication. MGSU and MGS should not be used. Brand consistency and reputation are key to MGA being recognizable. MGA is not the name of our institution, so please refrain from using it in text or in possessive form, except as noted above. Please make sure to update all directory listings to reflect the appropriate unit names and hours. We recommend posting both fall/spring and summer hours on directory pages so that there is no need for multiple updates. Use the directory-update instructions as a reference. The Office of Marketing and Communications (MarComm) maintains the university's institutional social media accounts. These accounts are used to interact with followers and communicate various messages that promote Middle Georgia State primarily to prospective students and other external stakeholders. We encourage the use of social media by internal units or student organizations interested in communicating with targeted audiences. The below social media guidelines are designed to help individuals or units of the university to create and maintain social media sites. Middle Georgia State expects all students, faculty and staff using social media on the institution's behalf to understand and follow these guidelines. We would like to offer some clarification on referring to institutional units. Please direct specific questions on your area to the leadership within your units. “Schools” and “Departments” refer to academic units offering instruction – “Department” is reserved for academic units, except for Police Department and Athletic Department. Offices may use “Office of …” or “… Office”. A recommended use would be to reference the parent office as “Office of …” with subordinate offices using “… Office”. Division of Academic Affairs - the Division of Academic Affairs is the term to denote the whole academic enterprise, faculty and academic staff, including schools, departments and offices. Within that division the most senior office is the Office of the Provost, and the Provost is also the head of the entire Division of Academic Affairs. Middle Georgia State University will abide by and follow " Important Information and Guidelines About the Use of Department of Defense Seals, Logos, Insignia, and Service Medals dated 16 Oct 2015."